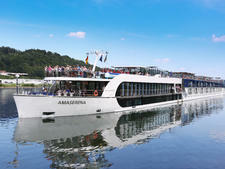 AmaWaterways has carved a niche for itself as offering advanced design with a more active shore experience. AmaSonata, which launched in 2014, continues that philosophy. 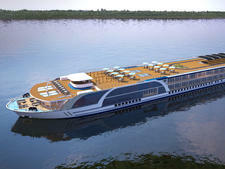 A key distinguishing feature is that most of its 81 cabins have two balconies, consisting of a French balcony (a sliding door that lets in light and air, but lacks an exterior platform); and an adjoining outside balcony that seats two. 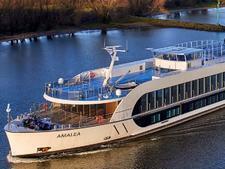 Even the non-balcony cabins are efficiently designed, attractive and relatively roomy. Public areas -- namely the dining room and the main lounge -- are light and airy and large enough that they never seem overly crowded. The vibe is relaxed. Onboard announcements are kept to a minimum, and they aren't broadcast into the cabins. 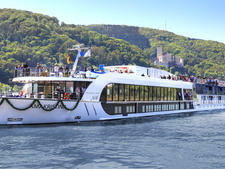 With the exception of several optional tours, shore excursions are included in the cruise price. So is the use of bicycles, wine at lunch and dinner, and Wi-Fi. 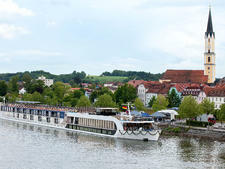 And in an effort to appeal to more active cruisers, the line offers some strenuous options, like hiking and cycling excursions, in addition to the usual city walking tours. It also divides many of its outings into three levels of physical exertion, so you can join a group that suits your pace. In 2015, AmaWaterways partnered with the active travel company Backroads to offer supported biking and hiking tours on select cruises; these cruises are a real workout and definitely appeal to a younger demographic than you typically see in river cruising. The food is excellent. 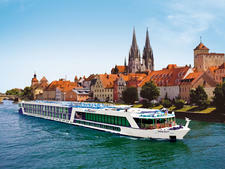 AmaWaterways takes pride in its membership in the world's oldest international gastronomic society, Confrerie de la Chaine de Rotisseurs, and its commitment to fine dining shows. 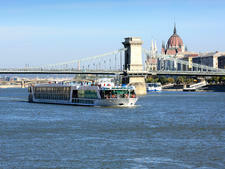 There's an emphasis on regional dishes, such as Vienna-style schnitzel in Austria and Hungarian goulash in Budapest. Dining room and cabin service was friendly, efficient and generally spot-on. Our jolly waiter remembered our preferences and worked with the kitchen staff to accommodate the vegan at our table. When we told our cabin steward she needn't bother with the nightly turndown service -- but we'd appreciate the pillow chocolates -- she delivered a cupful the next morning. The biggest wrinkle on our cruise came with the line's ID system. 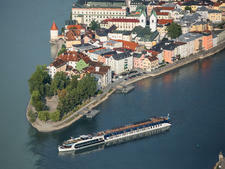 AmaWaterways issues picture IDs to guests, and requests they scan them when entering and exiting the vessel. It's common practice on oceangoing ships, where everyone must funnel through a controlled queue. But on AmaSonata, the system is basically voluntary. (You go to the desk, hand the ID over or scan it yourself, then exit on your own.) Consequently, it's not a failsafe way to determine whether everyone's aboard when the ship sails. 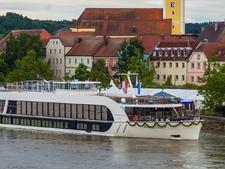 So imagine our surprise when, after dinner ashore in lovely Bratislava, Slovakia, we arrived 15 minutes before the scheduled 9 p.m. departure to see the gangplank lifted and two crew members preparing to cast off. Yes, we'd neglected to log out. But why were they leaving early? We hopped on board with an assist from the crew. Crisis averted, if not really understood. 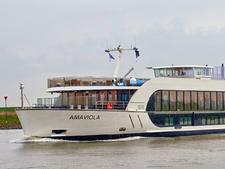 Cruisers on AmaSonata are primarily North American, though you'll find a handful of Australians onboard (AmaWaterways also partners with APT, an Australian tour company, so the name has some recognition down under). Baby Boomers comprise the bulk of the passengers. However, recent programs that gear excursions to three levels of rigor (gentle, regular and active) are designed to attract adults of varying ages who enjoy traveling together, if at sometimes different speeds. 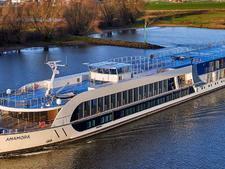 The Backroads trips also attract a younger demographic, as do themed cruises like the one focused on wine. Daytime wear is casual. Comfort is key, since most passengers are out on walking tours or cycling through the countryside. (Good walking shoes able to handle cobbled streets are a must.) Suggested dinner attire is "sophisticated casual" -- collared shirts and slacks for men, and dresses, skirts or dressy pants for women. Even for the weekly Captain's Dinner, a dressy affair on many cruises, the daily program noted guests were welcome to dress up, but it wasn't compulsory; men will be OK if they don't bring a jacket. However, shorts and sneakers aren't welcome in the dining room at dinner. 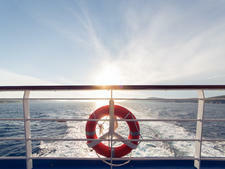 At least one daily shore excursion is included in the cruise fare. 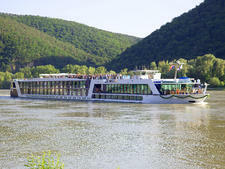 On our Danube cruise, options ranged from hourlong city walking tours, to group hikes and bike tours, to half- and full-day excursions in farther-flung locales, such as the Austrian Lake District and Salzburg. The ship's 25 bicycles are free for use on shore. Regional wines and beer are served with lunch and dinner (and a bottle of sparkling wine is on ice by the smoked salmon at breakfast). Soft drinks are also free with meals. Bottled water is delivered daily to cabins. The free Wi-Fi is fast and reliable. Gratis postcards are available at the front desk; they'll even stamp and mail them for you. Electrical adaptors, reading glasses, walking sticks, wheelchairs and shower chairs are also available for loan. 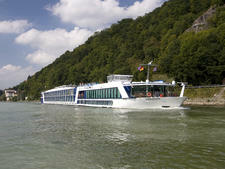 Suggested tips are 3 euros a day per person for the cruise manager and an additional 12 euros a day for the crew. Tips can be paid in cash or by credit card. The onboard currency is the euro. 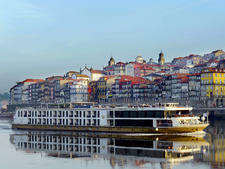 Suggested tips to excursion guides are 1 or 2 euros per person in cash. 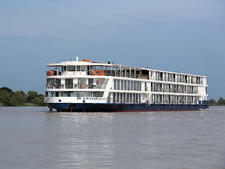 The 164-passenger AmaSerena is a family-friendly river vessel, with connecting cabins with state-of-the-art entertainment -- most of which include twin balconies.